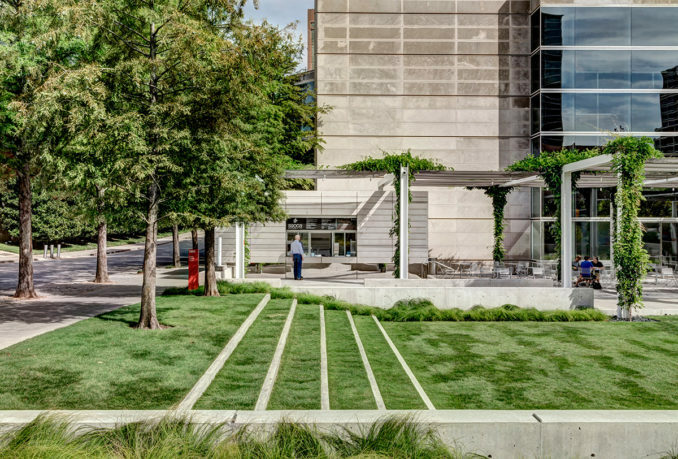 The powerful minimalism of Edward Larrabee Barnes’ Dallas Museum of Art demands a restrained, elegant solution that corresponds to and supports the architecture. The Eagle Family Plaza at the museum provides an essential new court at the north entrance of the 1984 museum’s campus. 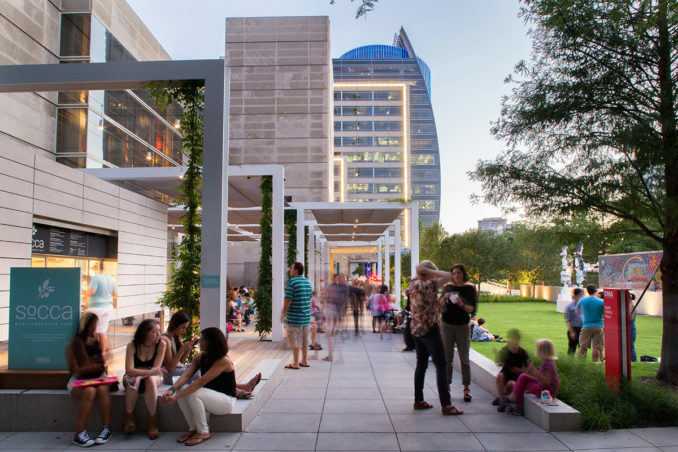 The primary goal of the Museum Board, donors, and landscape architects (joint venture between Hocker Design Group and StudioOutside) mirrors the museum’s mission, focusing on outreach, social equality, and accessibility to all; it provides the missing pedestrian connectivity of this “back” entrance to the attractive new adjacencies of Klyde Warren Park and the Uptown and Arts District neighborhoods beyond. (Dan Kiley’s original design focused on vehicular access that served as a pedestrian back door, mostly ignoring the undesirable freeway and Uptown.) The new design parti introduces flexible configuration options for a plaza, supporting multiple seasonal events at the museum. At the heart of the design is an expansive activity lawn. This open space is designed as a simple, level rectangle that can host special events and festivals or casual impromptu picnics. An architectural concrete wall holds the hybrid pedestrian/ vehicular zone to the north away from this level space, providing safe accessibility for all visitors and easily corralling children’s play. 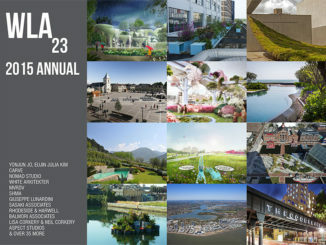 The eastern edge connects to streetscape through turf terraces held by narrow bands of poured-in-place concrete. An adjacent sloped walk provides an accessible new access point to multiple museum entrances. Finally, small exhibition space is featured on axis with the museum’s glass wall entrance where the first commissioned work is Pas de Deux (Plaza Monument), a 14-foot tall sculpture by Rebecca Warren. The site-specific work serves as the first in a series of rotating works to be featured in the new north lawn of the museum. 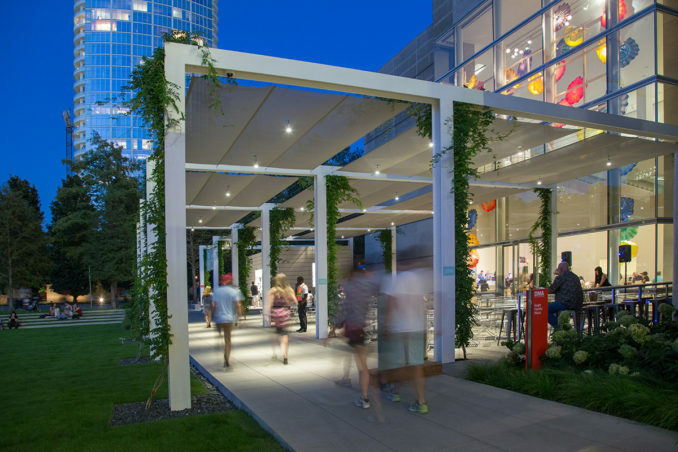 The importance of creating a shaded microclimate for protection from the Texas sun elevated Hocker and StudioOutside’s design programming for the space. Following Kiley’s campus precedent of wisteria-covered trellis structures, a minimalist steel superstructure was conceived to carry the muscular vine overhead. 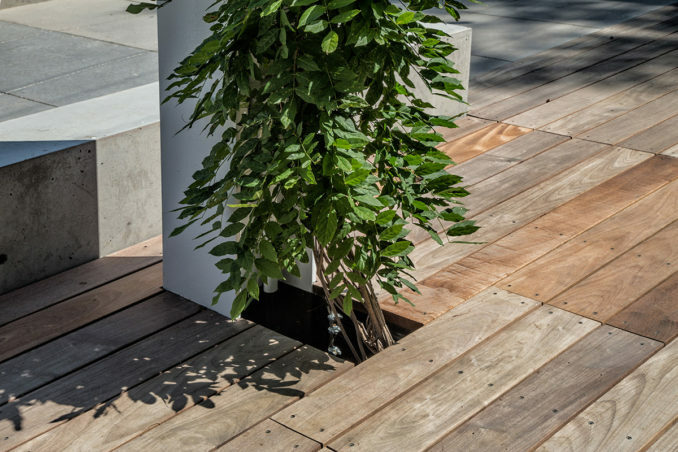 The basic anatomy of the trellis structure consists of steel wide flange I-beams, stainless steel cable, and horticulture. The series of large, white steel “staples” create a rhythm and sequence following architecture’s grid. Panels of woven fabric create immediate shade and protection to shelter the space from the sun. Wisteria vines planted at each column have begun to envelope the canopy, creating a seasonal display of winter structure, spring blooms, and summer green that provides shade during warm months. 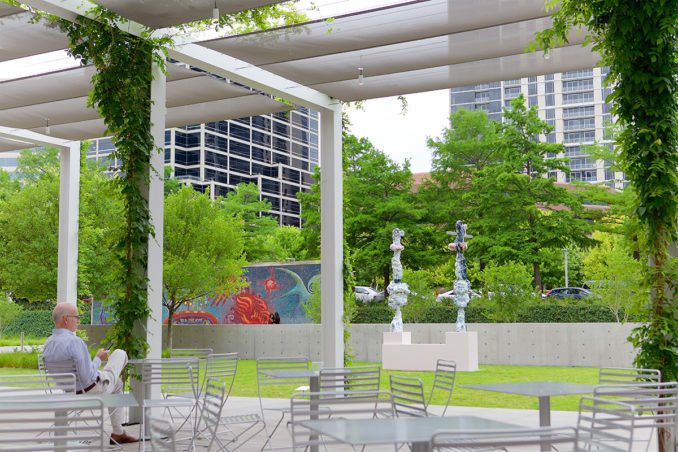 This sheltered space has opened the DMA Café to the exterior, offering outdoor seating on a carpet of meticulously detailed ipé decking, where even the screw patterning conforms to architectural grid. The decking is furnished with moveable café style chairs and tables, creating flexible seating options for the café, food pavilion, and Arts District visitors. The integration of an outdoor food pavilion at the east end of the covered space features food plus on-tap wine and beer options. New landscape updates and site connections on the west and north edges of the project offer improved visibility from the street, for both pedestrian and vehicle. 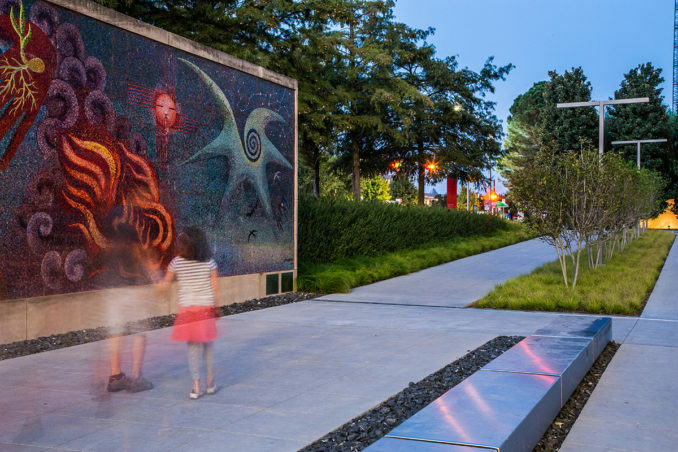 The northern edge was retained with an engineered green wall structure that flanks either side of the large mosaic installation, “Genesis, the Gift of Life” by Covarrubias. This wall installation was added much later than Kiley’s original design, and it dominates the axial alignment from the museum’s north entrance – now in a more cohesive way. A low, sinuous stainless curb provides pedestrian protection for viewing and selfies in front of the majestic mosaic. Extensive regrading and replanting of this area softened the zone considerably. 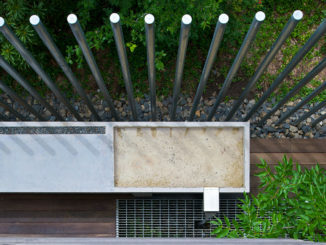 The site was replanted with a native and adapted plant palette. 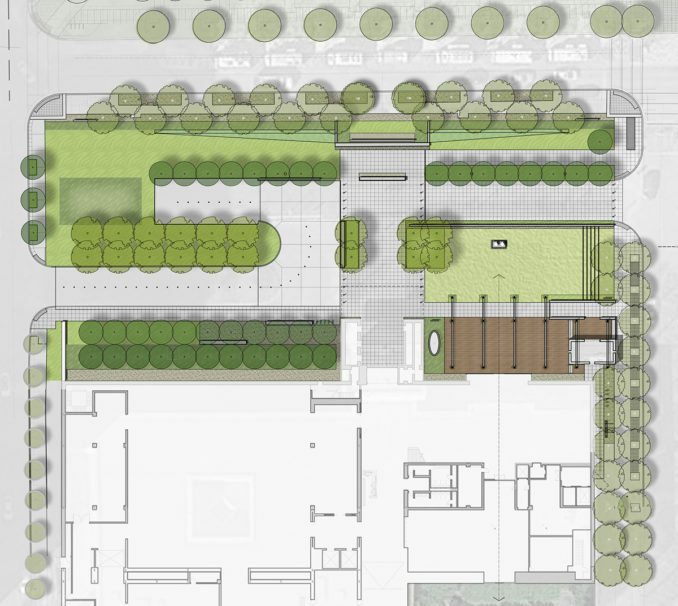 An overlay of large overstory and smaller ornamental trees helps to organize the site with east-west axial allées of the cedar elms and saucer magnolia trees. 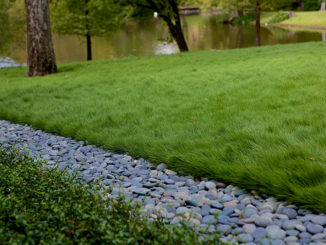 Planting areas are covered in a lush carpet of sedges, ferns, hydrangeas, and dwarf palmettos. 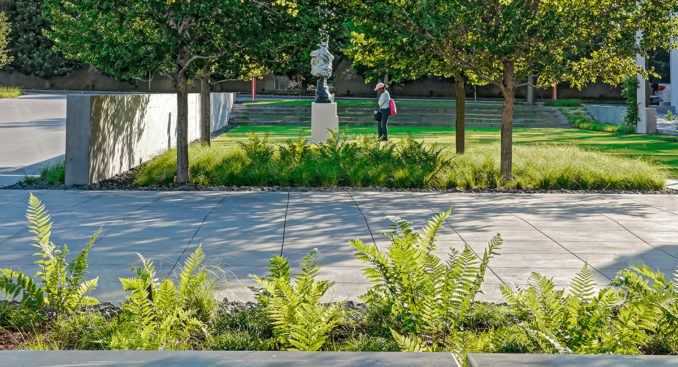 Collectively, the textures of the ground plane planting provide a tapestry of cool lushness in a typically hot, dry, and unforgiving urban place. 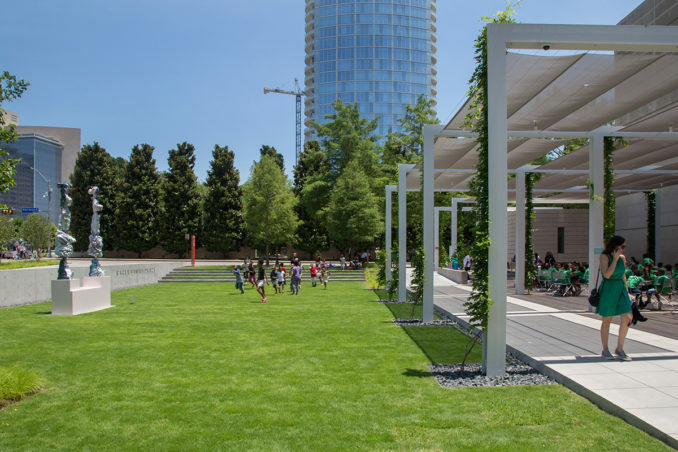 The completed project, dedicated in April 2016, safely encourages pedestrian access, increases outdoor programming potential, provides connectivity to Klyde Warren Park, and enhances the overall cultural experience of the Museum. 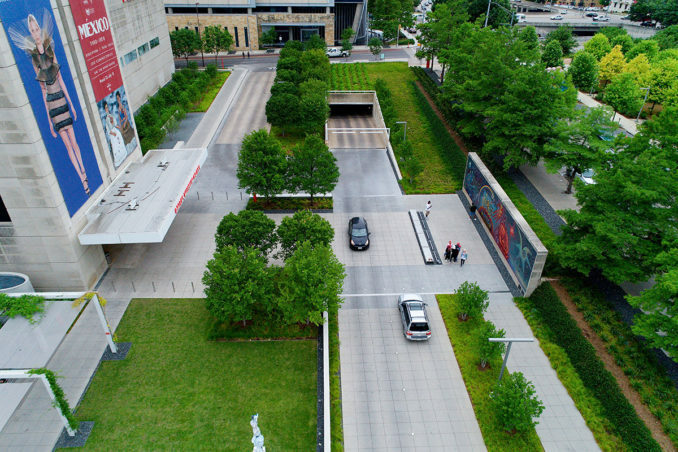 The increased visual porosity, linkage to the site’s surroundings, pedestrian cross-traffic through the site, and shared parking opportunities open the museum to new audiences in a more family and visitor-friendly way for hours extending beyond the museum’s normal operations.